How do you share with your children the lessons you’ve learned, or the values and ideals that are important to you? I’m learning that parents must walk a fine line between imparting knowledge and wisdom (which may or may not fall on deaf ears) and stepping back to allow children to learn from their own experiences. I’ve written about the importance of donating, about how we want our son to be known, and about contemplating your own legacy. Underlying each of these is education. Some very compelling statistics regarding education and earning potential can be found here. Our schools have varying degrees of success in preparing our children for life across a number of subjects. But I am a firm believer that education starts at home. Parents share their own knowledge in many different ways. One of the best ways I’ve seen is to write a letter, or series of letters, to your child(ren) that impart some sort of wisdom, based upon your own life experiences. In some ways, that’s what I had in mind when I started this blog. One letter that has stuck with me was on the internet several years ago. The link is here, and it’s a wonderful piece that a mom wrote to her son as he was going off to college. More recently, a friend of mine from college wrote a series of letters to his two children, and he’s posted them on his blog. He’s a great writer, and his letters cover a lot of different topics. How do we bring personal finance education into the home? A topic of importance in our household is personal finance – building a strong foundation of knowledge that our son can carry throughout life. Simplicity and minimalism are also important to us, but those concepts are a little harder for an 8-year-old to understand so we’ll add more emphasis to those two as he gets older. We enjoy, and have had great success with, the “three jar” method of teaching personal finance. But we’ve taken the liberty of adding a couple of our own wrinkles to this tried and true approach. For those of you that aren’t familiar, the three jars are save, share, and spend. I’m a firm believer in learning by using real mason jars and real money – especially for younger children – because I think the take-aways are much more meaningful when you’re dealing with cash. · Allowance: We pay our son his age per week (currently $8). There is plenty of debate as to whether or not this money should be tied to household chores, or simply given for educational purposes. Call it what you want (allowance, stipend, etc.) and create whatever stipulations fit your household goals. 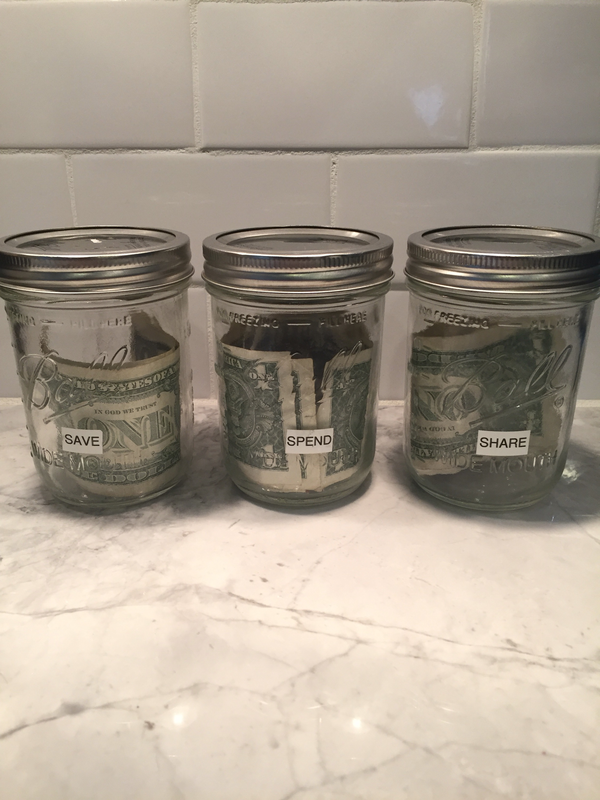 – We always put a minimum amount in each jar, as follows: $1 in spend, $1 in share, and $2 in save. We are striving for at least a 20% savings rate, hence the $2 in save. This also teaches the importance of “paying yourself first”. – Now comes the fun part. Our son gets to choose what he does with the remaining $4. – Whatever additional money he puts into the “save” jar, we match it dollar for dollar into save. Once he’s accumulated $20 in his save jar, we take him to the bank to deposit the money into a savings account we opened for him when he turned seven. He tells us he’s currently saving to buy a house! – At the end of each month, we pay him 5% interest on whatever is in his “spend” jar (must be at least $1 worth of interest to get it). I realize 5% is way more than any bank would pay, but it helps make the interest a little more of an incentive. He gets to decide when, and how, he uses the money in his “share” jar. Among the ways he’s used it so far are to buy school supplies for under-privileged children, donate it to church, and support a friend of his and her mother via a donation toward a mission trip. · These modifications ensure he gets to make some of his own choices with his money. · By matching any contributions beyond the $2 minimum into save, we’re emphasizing the importance of saving. · Paying interest on the money in “spend” at the end of the month incentivizes him to not spend it all at once. Plus, he’s learning the concept of interest! · Aside from some extreme cases, he’s allowed to use his “spend” money on whatever he wants. We’d rather he learn valuable lessons about spending on small things now, versus down the road when the stakes are higher. · He’s not allowed to spend more than he has in his “spend” jar (i.e., no borrowing). If he doesn’t have enough to cover it then he can’t buy it. Right now, this money is mostly used for small toys and souvenirs that he may see in a store or at a sporting event. · Before we take a trip, or go to an event in town, we’ll count the money in “spend”, should he want to purchase something. Instead of carrying the cash with him, we’ll pay for the item with a credit card, and have him reimburse us out of his “spend” jar when we get home. Doing this has also allowed us to begin conversations on how credit cards work! · We also allow for reimbursement if the item he wants to purchase is through an online vendor. · Since he’ll be receiving more money as he grows older, he’ll be expected to cover more of the things he wants to buy; for instance, some of the things his mom and I pay for now, like sporting equipment and clothing that falls more under the “wants” category. And, by putting any money your child reimburses you back into the stash you’ve set aside for the jars, you can keep it as a closed-loop system. We began with $100 worth of $1 bills, and replenish only as needed. What’s really entertaining is explaining to the teller that this money is being used for educational purposes, and not at one of the many adult entertainment venues in Atlanta! leave the important lessons to chance.